Australians are spending just four per cent of their week immersed in nature yet almost three hours a day glued to their mobile devices, despite the majority of Australians (89 per cent) agreeing that time spent outdoors significantly helps reduce stress and increase levels of calmness. New research from Planet Ark and Toyota Australia to mark this year's National Tree Day and Schools Tree Day has found that "screen time" and "green time" do not need to be mutually exclusive and can work together to positively impact not only the preservation of our environment but mental and spiritual health and wellbeing. "We have conducted this research to explore the disconnect between how nature makes people feel and our current behavior towards it and it is interesting to see that despite our awareness of the positive effects of nature, we are still spending so little of our free time properly immersed in it," said Planet Ark CEO Paul Klymenko. The research found that one in three Australians believe that spending time in nature makes them feel more relaxed with a positive impact on their mental and spiritual health while 90 per cent of thought that spending time in nature has many benefits for the wellbeing and development of kids. According to the research, one in four Australians already use nature-related apps or apps that encourage or enhance time spent in nature whether they are gardening, bird-watching, exercising or hiking. Explore the most popular hiking trails in Australia with hand-curated trail maps and driving directions as well as detailed reviews and photos from hikers, campers and nature lovers. A field guide to Australian birds based on the Gaia Guide website that can be used without an Internet connection. The app supports rapid identification based upon location, type, colour and size. Contribute information to global databases and become a citizen scientist, allowing you to contribute information to global biodiversity databases. This app lets gardeners and nature lovers identify 4,000 plants and counting. Take or submit a photo to identify thousands of plants, flowers, or trees, and then learn more about them with a detailed description. An app recommended for those that want to gamify their nature spotting. The game takes players outdoors to discover, map and help protect life on our planet. Sightings contribute to real research and conservation. "While we recognize that a majority of Australians prefer to switch off completely while in nature (64 per cent), a third of us believe that technology can help enhance our time outdoors," adds Mr Klymenko. Toyota Australia Chief Marketing Officer Wayne Gabriel said this new research also illustrates how much Australians value our environment and he hopes it will encourage people of all ages to participate in the annual tree-planting events taking place right around the country at the end of July. "Toyota Australia's long-standing involvement in National Tree Day demonstrates our commitment to achieving zero environmental impact by the year 2050, and Toyota's support for the long-term sustainability of our natural environment," said Mr Gabriel. "Any time spent outdoors has a positive impact on our physical and mental health. All Australians should use technology to the best of their ability to learn more about their environment, locate their local tree planting site and teach the next generation about the benefits of this commitment to the environment as well," added Mr Gabriel. 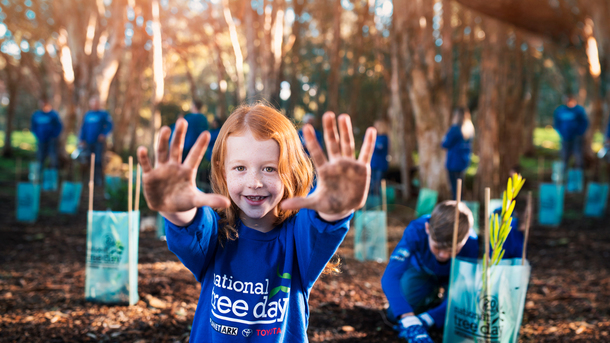 Schools Tree Day and National Tree Day are Australia's largest annual tree-planting and nature care events and take place on Friday 27 July and Sunday 29 July. This is an initiative organised by Planet Ark in partnership with Toyota Australia and its Dealer Network which provides on-the-ground support at tree planting sites across Australia. To find out more or to take part, visit treeday.planetark.org, call the National Tree Day Hotline on 1300 88 5000 or visit your local participating Toyota Australia Dealership.